This article is about the Dickens character. For the musical band of the same name, see Uriah Heep (band). Uriah Heep is a fictional character created by Charles Dickens in his novel David Copperfield. Heep is one of the main antagonists of the novel. His character is notable for his cloying humility, obsequiousness, and insincerity, making frequent references to his own "'umbleness". His name has become synonymous with sycophancy. [Heep's face] was quite as cadaverous as it had looked in the window, though in the grain of it there was that tinge of red which is sometimes to be observed in the skins of red-haired people. It belonged to a red-haired person—a youth of fifteen, as I take it now, but looking much older—whose hair was cropped as close as the closest stubble; who had hardly any eyebrows, and no eyelashes, and eyes of a red-brown, so unsheltered and unshaded, that I remember wondering how he went to sleep. He was high-shouldered and bony; dressed in decent black, with a white wisp of a neckcloth; buttoned up to the throat; and had a long, lank, skeleton hand, which particularly attracted my attention, as he stood at the pony's head, rubbing his chin with it, and looking up at us in the chaise. 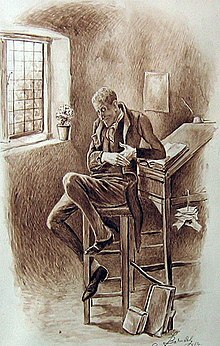 Much of David Copperfield is autobiographical, and some scholars believe Heep's mannerisms and physical attributes to be based on Hans Christian Andersen, whom Dickens met shortly before writing the novel. Uriah Heep's schemes and behaviour are more likely based on Thomas Powell, employee of Thomas Chapman, a friend of Dickens. Powell "...ingratiated himself into the Dickens household" and was discovered to be a forger and a thief, having embezzled £10,000 from his employer. He later attacked Dickens in pamphlets, calling particular attention to Dickens' social class and background. The characteristics of grasping manipulation and insincerity can lead to a person being labelled "a Uriah Heep" as Lyndon Johnson is called in Robert Caro's biography The Years of Lyndon Johnson. Seymour Fleming, a character in the play Babes in Arms, is also called Uriah Heep. Author Philip Roth once compared President Richard Nixon to Uriah Heep. More recently, historian Tony Judt used the term to describe Marshal Philippe Pétain of the French Vichy government. Pakistani-British historian and leftist political commentator Tariq Ali likened Pakistani dictator Muhammad Zia-ul-Haq to the character. Late Australian journalist Padraic (Paddy) McGuinness, writing in The Australian Financial Review, referred to former Australian Prime Minister Paul Keating as Uriah Heep, after a fawning interview on ABC television in which Mr. Keating, the owner of extensive real estate holdings and a man generally acknowledged to have a robust ego, affected great humility. In film and television adaptations, the character has been played by Peter Paget (1934), Roland Young (1935), Colin Jeavons (1966), Ron Moody (1969), Martin Jarvis (1974), Paul Brightwell (1986), Nicholas Lyndhurst (1999) and Frank MacCusker (2000). The British rock band Uriah Heep is named after the character. In the BBC television series Blake's 7, the computer character Slave was described by Peter Tuddenham, who voiced it, as "...a Uriah Heep type of character...." A reference to the "'umble' Uriah Heep is the arrant hypocrite" is given in Augustus Hopkins Strong's Systematic Theology. In Robert A. Caro's The Path to Power, Lyndon B. Johnson is said to have resembled the personality of Uriah Heep. A reference to the character of Uriah Heep exists in the Half Life 2 franchise. A friendly NPC character of one of the aliens from the game was considered, during development, to be a companion to the player for parts of the game, named "Heep". This idea was scrapped in the original game but recycled for Half-Life 2: Episode Two, where a lab assistant of the same species is named Uriah. ^ "Who's who in Dickens", by Donald Hawes. Thursday 1 October 2009. ^ "Masterpiece Theatre: David Copperfield". Retrieved 1 October 2009. ^ "The Extraordinary Life of Charles Dickens". Retrieved 2 September 2009. ^ Philip Roth. "Breast Baring." Vanity Fair October 1989: 94. ^ "Peter Paget". British Pathé. Retrieved 7 February 2012. ^ "Uriah Heep". IMDb. Retrieved 26 December 2011. ^ Kirk Blows. "Uriah Heep Story". www.uriah-heep.com. Retrieved 15 March 2007. ^ Tony Attwood; et al. (1994). Blake's 7: The Programme Guide. London: Virgin Books. p. 225. ^ Strong August Hopkins (1907). Systematic Theology. Philadelphia: American Baptist Publication Society. p. 832. ^ Robert A. Caro (1982). The Path to Power. New York: Random House. p. 489. This page was last edited on 14 March 2019, at 04:41 (UTC).